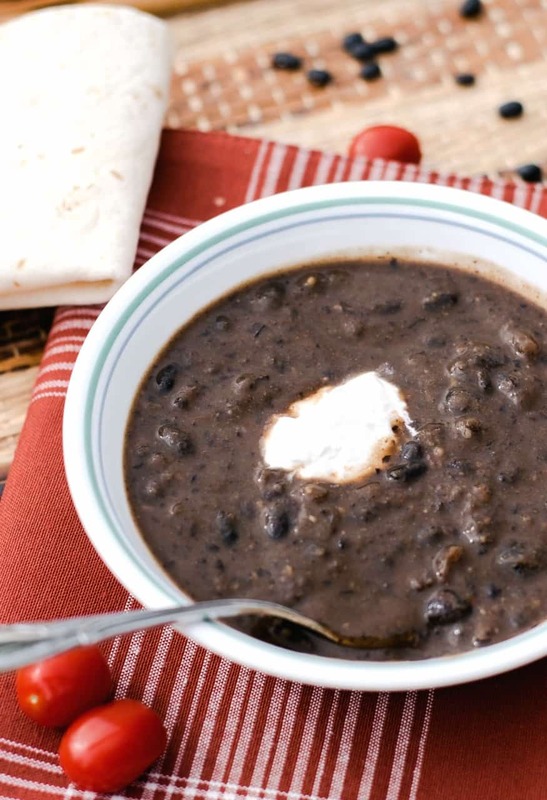 I made my own version of Panera Bread’s Vegan Black Bean Soup last night, and thanks to my Instant Pot Pressure Cooker – it was fast and easy! And tasty? It tasted just like the restaurant version, only mine is completely oil free! Besides being full of all that Black Bean goodness (protein, fiber, calcium, iron, etc), this soup is also literally LOADED with veggies. Onion, garlic, celery, green chile, tomatoes, and red bell pepper add even more antioxidants and phytonutrients, without even a HINT of Saturated Fat or Cholesterol. And none of that fake processed stuff either…..nope….just REAL food. WHOLE foods…. like nature intended. Did I mention it tastes great? 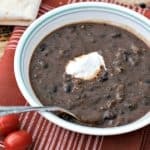 It is EVERY bit as good (if not BETTER) as the restaurant version, and by using my Instant Pot Pressure Cooker I reduced the time to cook the dried Black Beans down to about 30 minutes. So if you’re looking for another Instant Pot Recipe – or maybe just another great ‘South of the Border’ Recipe – then definitely give this one a try. Start by finely chopping the following vegetables into your Instant Pot. Set your IP to SAUTE mode and using about ¼ of Low Sodium Veggie Broth, sauté the veggies until soft. Mix that up well, then add 2 additional cups of Low Sodium Veggie Broth, and 3 Cups of Water. Stir well. Next, rinse and pick over 2 cups of dried Black Beans (removing any odd-shaped ones, rocks, whatever) and add the beans to the pot. Again, stir well. Finally, pour one can of Rotel Tomatoes with Green Chiles right into the center of the soup. DO NOT MIX. Tomatoes scorch real easy if they come in contact with the hot outside edges of the pot, so leave them in the center. Attach your IP lid, make sure the vent plug is set to SEALING, and set your timer for MANUAL MODE for 30 minutes. Use an immersion blender if you have one to blend the remaining soup until smooth, then add the beans you removed back in and stir well. If the soup is thin, I like to add 1-2 Tbs of Tamale Corn Flour (Masa) to thicken it up. Serve with Salsa, Lime Wedges, a dollop of my Green Chili Sour Cream if you like, and maybe some homemade Cornbread for a complete meal. As always, I hope you enjoy this flavorful and healthy soup. Let me know what you think and be sure and like it on Facebook or Instagram! 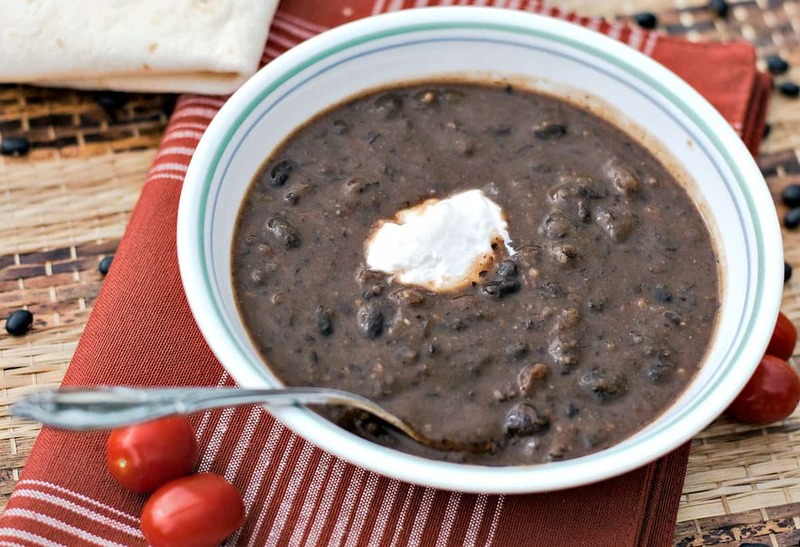 A copycat recipe of Panera Bread's Vegan Black Bean Soup, using an Instant Pot. Cooks in just 30 minutes! Stir in Oregano, Chili Powder, Cumin, Salt, and Pepper. Slowly add remaining 2 cups of broth and the 3 cups of water and stir well. Rinse 2 cups of dried Black Beans, removing any debris, and add to pot. Pour the Rotel Tomatoes into the CENTER of the soup and DO NOT STIR. Attach lid, make sure vent is set to SEALING, and set timer for MANUAL MODE for 30 minutes. Using a slotted spoon, remove 2-3 cups of the beans & veggies and set side. Using a immersion blender (or regular blender) carefully blend the remaining soup until smooth. Add the beans & veggies you set aside back in and stir well. thick if necessary using 1-2 Tbs of Masa Corn Flour. Garnish with Salsa, Lime Wedges, and my Green Chile Sour Cream if desired. 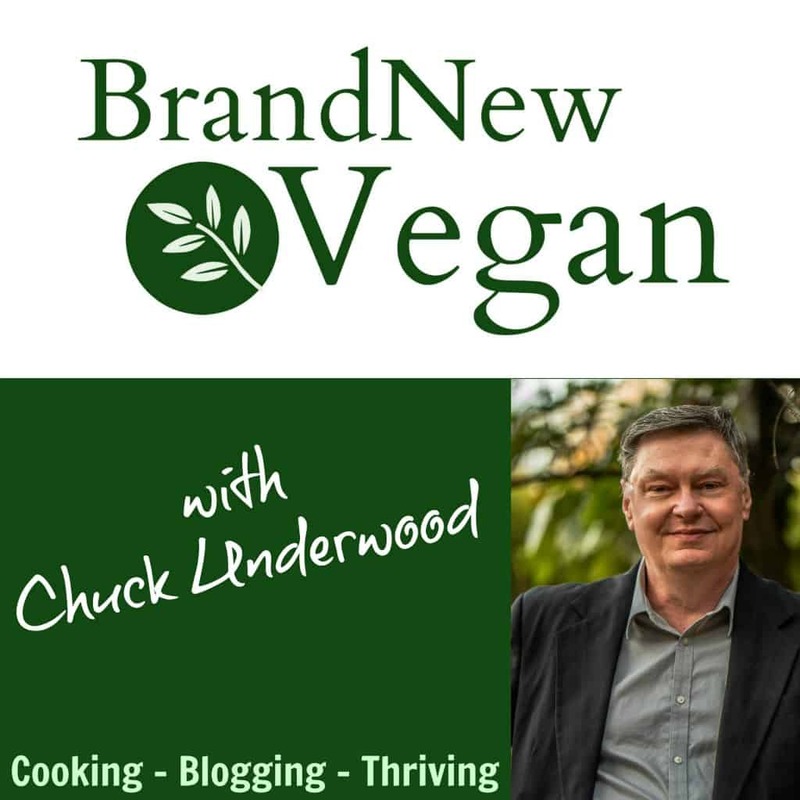 My Country Vegan Cornbread goes great with this soup! Made this soup yesterday. The only thing i left out was the celery as i didnt have any, but wow! Amazing soup! Ate it with Jasmine rice, definitely a keeper! Thanks Chuck! Great soup! Yum! My darling omnivore men, hubby and 8 yr old grandson, especially the grandson, love black beans. My challenge: hubby tolerates onions only if they dissolve completely away in whatever dish I make, or he picks them out or just skips the meal. The grandson is even worse! All that veg, he complains, as he points to the offenders, (and his eyes are sharp), “I don’t like that green, that thing (aka onion), yuck, I don’t eat those red things, and I don’t eat anything made with tomato!” (I can hardly wait to catch him devouring pizza. **wicked grin**) You mention blitzing half the soup. Hmmm, brilliant idea. My solution: I add the dry beans to the pot last, instead of the tomatoes going in last. Once all the veg is cooked I add the water, broth, tomatoes and spices, stick that immersion blender in the pot and blend away! Then I add the dry beans and cook them in the ipot. Sneaky? Yes and no. Grandson asks for seconds, yes sneaky. But hubby knows I blend up the onions, that’s okay by him as he, too, goes back for seconds! Thank you for a great soup recipe! Oh, btw, the broth comes out nice and thick right out of the pot. If it looks a little thin I just mash up some of the beans against the side of the pot with the back of a soup spoon and give it a good stir. This is great! 45 min start to bowl and tastes real good. Excellent consistency, nicely flavoured. Made this, and your cornbread for dinner. So yum! I subbed date paste for the sugar and maple syrup on the cornbread. I just made this tonight and loved it. I forgot to grab a few things at the store so I had to substitute canned diced tomatoes for the Rotel with green chilies. I was in luck to have a small can of green chilies so I took a spoonful of that and added it. The flavor was excellent for this soup! I happen to like mine smoother so I blended the entire batch with my immersion blender, but that’s just my preference. Thanks very much for this IP win! It definitely helped me to get more comfortable using it. I will be making this soup again and again. It’s cold and windy today in NorCal, so I decided to make this soup. It is so good! For the chili powder, I used half regular and half chipotle. I didn’t have Mexican Oregano, so I used the regular kind. But those were the only changes I made. I NEVER eat canned soup so I am always looking for satisfying soup recipes for when the weather gets chilly and this one will definitely be in my rotation. Thanks! Very good I did add a bunch of cilantro with the tomatoes and blended all ingredients when finished was perfect! Should the beans be soaked overnight? Not necessary with a pressure cooker. The red bell pepper isn’t included in the recipe summary. I made a few tweaks based on what I had. This is a great soup!